If you’ve filled out my client questionnaire, I already have some idea of which keywords you want to target with your content. This is important so that people can find your site in the search engines, so I back it up with some research of my own. I’ll almost certainly take a look at the keywords your site is already using, and will use tools such as the Google keyword tool to find more long tail keywords that I can use. I have a thorough knowledge of several topics, but I don’t claim to know everything. That’s why I’ll research your topic before I start to write. For me, researching an article is more than just checking what’s in Wikipedia and rewriting it. I use a number of sources and check these carefully to make sure I can trust the information before I use it in your article. I’ll usually keep a document open so I can make a note of anything that’s particularly noteworthy to give your article some color. Then I’ll add a couple of keywords as a reminder. All of this will come in handy later, but making a note helps to keep it in my mind as I write. Then I write for as long as it takes to finish the article. If I can, I’ll do this in a continuous flow, but sometimes as I write I’ll find that I need another bit of information, so I’ll go back to the research phase. I’ll then let the article sit for a short while before moving onto the next phase. This is where I reread the article, fix anything I don’t like and check that I’ve included keywords (only a few; keyword stuffing is a no-no and won’t help you at all). I go back to the brief and check to make sure I’ve met all your targets – and my own. Then I’ll adjust the language (I write US/Canadian/UK English depending on your preference), spell check and give a final read before sending it to you. As you can see, I’m very thorough, and on the plus side, I usually get it right first time – most clients don’t need revisions. That’s why I’m worth the rate that I charge. Nice letter, Sharon. In my experience, as in your own evidently, people like to know exactly what they are paying for. Great letter. It really helps to clarify the level of quality, skill and integrity that you bring to your craft. I especially like your statement that “researching an article is more than just checking what’s in Wikipedia and rewriting it.” For quality work, research from more than one source is needed. At least your clients will know that when they hire you, they are getting an article or post that is truly original. Thank you both for your comments. I’ll be including this on my client resources page when it’s live. Fabulous reasons why pro writers get more money. 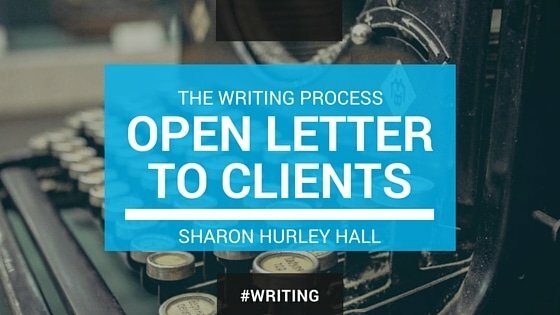 😉 Clients (even those used to working with pro writers) need to know their ROI. While I’m fully prepared to show a client what my copy can do for them (and the time/effort/talent behind the scenes), I’m not willing to convince or persuade a prospect who’s unwilling to pay market rates. I don’t have time for that, and there’s so many wonderful prospects and clients to work with – those that appreciate a talented writer. Nice article – keep up the good work! Thanks, Laura. As professional writers, we make the process look so easy that sometimes clients have no idea what they’re getting. This gives a bit of insight into the process that happens in the background. I may add a few more for other types of writing. Nice letter and probably super helpful. I may have to adopt something similar. Thanks so much for sharing. Glad you have found it useful, Carrie.